It emerges primarily through the medial epicondyle of the humerus by the common flexor tendon. 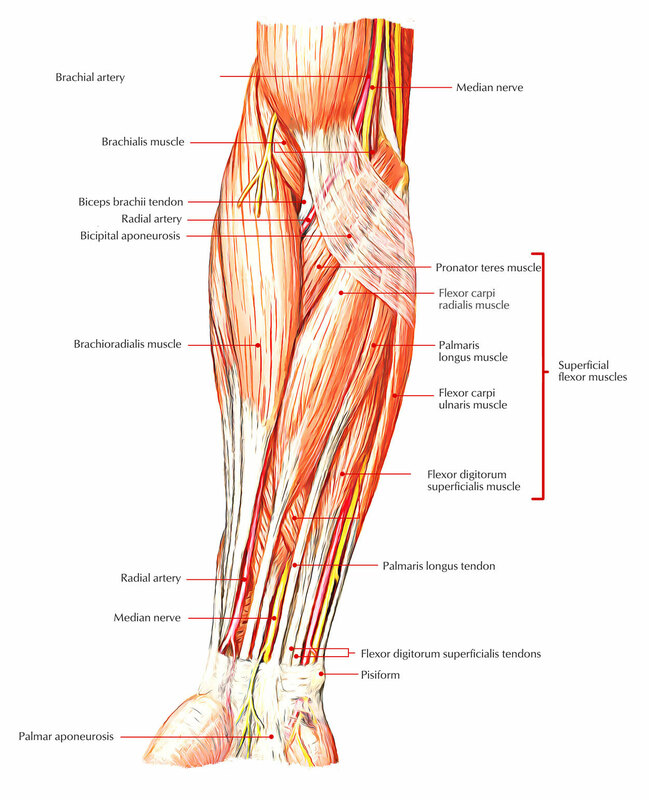 It also emerges via the surrounding intermuscular septa as well as through the antebrachial fascia. Its long cord-like tendon connects towards its distal portion and also connects the apex of palmar aponeurosis and travels superficial towards the flexor retinaculum. The palmaris longus muscle is located among the flexor carpi ulnaris along with the flexor carpi radialis muscles and it is missing in approximately 15% of the human population. 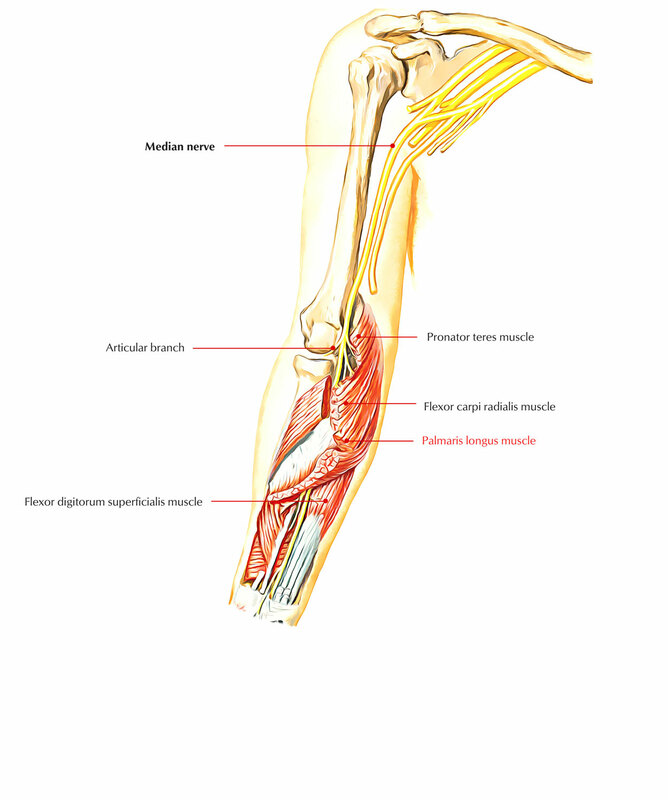 It is a spindle-shaped muscle including a long tendon, which enters the hand and connects to the flexor retinaculum and also to a broad layer of deep fascia, the palmar aponeurosis, which underlies and is connected to the skin of the palm as well as fingers. The palmaris longus muscle even resists shearing impacts at the skin of the palm at the time of gripping, along with its function as a supplement flexor of the wrist joint. The palmar aponeurosis stands for the distal portion of the tendon of palmaris longus. The palmaris longus bears a resemblance to the plantaris muscle at the back of the leg. Morphologically, palmaris longus is a weakening muscle having small short belly along with a long tendon. It is missing in one or both sides within nearly 10% of individuals, usually on the left side, but its activities are not missed. Therefore, its tendon is usually utilized by surgeons for tendon grafting. It is innervated through the median nerve with root value C8 via the medial as well as lateral cords of the brachial plexus. The skin above the muscle is innervated through roots C7 along with T1. Palmaris longus is an unsteady flexor of the wrist. But, it can have minor activity in flexing the metacarpophalangeal joints when it contracts the palmar fascia, due to its connection to the palmar aponeurosis. The tendon is located at the medial side of that of flexor carpi radialis. The tendon of palmaris longus may be detected just proximal towards the wrist, specifically where it is the most central framework while flexion of the wrist is resisted. Whenever a tendon gets ruptured within the wrist, the palmaris longus tendon may be extracted via the flexor retinaculum and implanted to replace the ruptured tendon. The tendons most generally changed or augmented via the palmaris longus tendon whenever disrupted are the long flexors of the fingers along with the flexor pollicis longus tendon. The palmaris longus muscle is the most popular for use within tendon grafts for the wrist because of the length as well as diameter of the palmaris longus tendon, and because it may be utilized without creating any operational defects.